The attribution of the world’s most expensive painting – the $450 million Louvre Abu Dhabi Salvator Mundi – has collapsed under the combined weights of two scholars’ findings and the picture’s own artistic and art historical implausibility. Having disappeared immediately after its world-record sale at Christie’s, New York, in November 2017, this Leonardo-in-hiding is also mired in allegations of a joint involvement in the sale by presidents Trump and Putin. 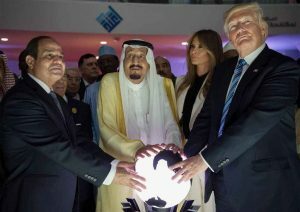 The toxic proximity of those two heads of state is a matter of intense national political concern in the United States where high-level official investigations are underway – as are a number of legal actions concerning auction house buyer/seller conflicts of interest. As those disputes play out, we consider the workings of today’s art historical and art market interface. In the 1990s we claimed common failures of connoisseurship in bad restorations and misattributions but thought the latter less serious because potentially correctable. That distinction is dissolving as increasingly many upgrading attributions are made on the back of “improving” restoration transformations. Generally speaking, connoisseurship shortcomings are evident in failures to detect outright fake old masters and in too-ready acceptances of elevated restoration-enhanced school works. Purpose-made fakes are closely related in their fabrications to the painted “recoveries” of supposedly original authentic appearances on stripped-down pictures. 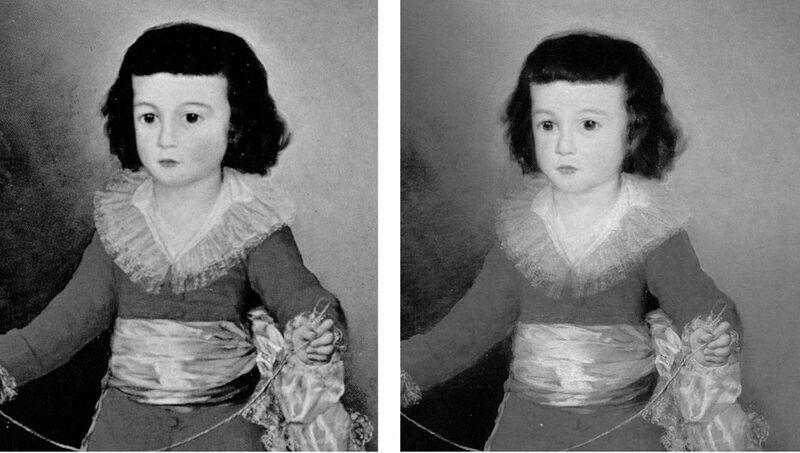 (See “A Restorer’s Aim – The fine line between retouching and forgery”.) The fakery of artificially distressed new paint and false painted craquelure is common to routine restorations; to restoration-assisted upgrades; and, to outright fakes. On the additional, extraordinary rise of the “painted-in” insinuation of computer-generated virtual reality into old master pictures, see “The New Relativisms and the Death of ‘Authenticity’” and Fig. 4 below. Above, Fig. 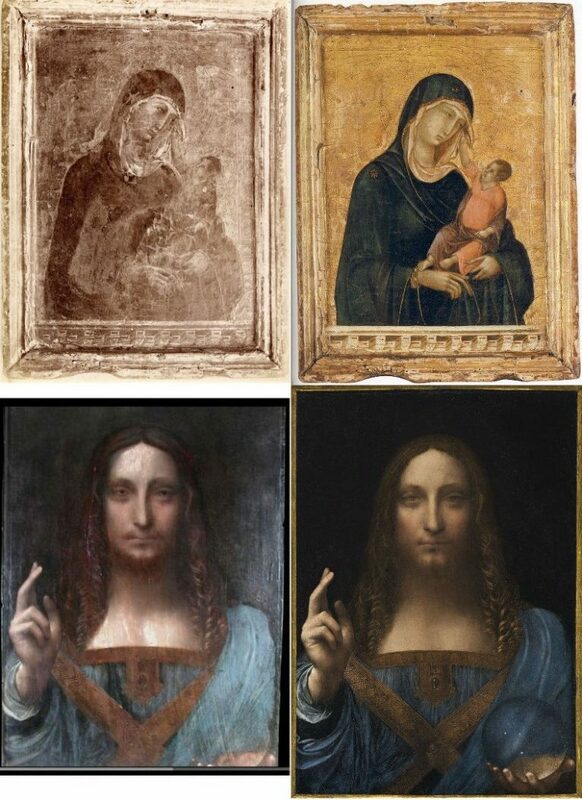 2: Top row, the Metropolitan Museum’s Duccio Madonna and Child, as seen in 1904 and in 2004 (when sold for c. $50 million); above, the Leonardo Salvator Mundi as seen in c. 2005 and in 2017 (when sold for $450 million). Above, Fig. 3: Top row, the present Louvre Abu Dhabi Salvator Mundi painting as seen in 1912 and when sold in November 2017. Bottom row: as at the same dates but showing some intermediary restoration states. Attributions, like restorations, are made in socio-cultural contexts. Here, we examine the marketing of the upgraded Salvator Mundi with reference to the marketing of a picture that had received a spectacular upgrading a century earlier – the Metropolitan Museum’s 2004 acquisition of a tiny Duccio Madonna and Child. In both cases we see elevations of studio works that had first emerged at the beginning of the 20th century and were converted through restorations into claimed major autograph works. In both cases, when viewed dispassionately and art critically, the upgraded works are seen to stand anomalous within their allotted oeuvres. In both cases, the elevations thwarted the articulation of potentially more fruitful and better informed art historical narratives. In studying the two cases we encounter errors of connoisseurship that rest on plain failures to look; failures to discern; and failures to make use of the sharpest art critical tool in the connoisseur’s tool box – the humble photo-comparison. This methodological abstemiousness can seem wilful and perverse as much as neglectful – some disavow photo-testimony outright as a critical tool. In the visual arts, and with today’s greatly enhanced photographic means of reproduction and transmission, there can no excuse for advocates’ declining to provide visual demonstrations of claims made in support of attributions or restorations. Where once a respected scholar might have proposed an attribution in an academic journal or forum in anticipation of critical responses, today, at the high end of the art market, teams of professional supporters are assembled one-by-one behind the scenes prior to some Big Media Announcement of a “discovered” masterpiece. Within such procedures, successive scholars’ invitations to appraise works are inescapably compromised by awareness of already committed supporters. At a certain point of accumulated critical mass it can be felt a) tempting to join and/or b) professionally unwise to dissent openly. A sense can grow that nothing will be permitted to count as evidence against that which has been collectively endorsed, and that any opposition will incur a risk of being dubbed a “hostile” party. At the low end, the trade euphemism for the many restoration-enhanced upgrades is “a sleeper”. 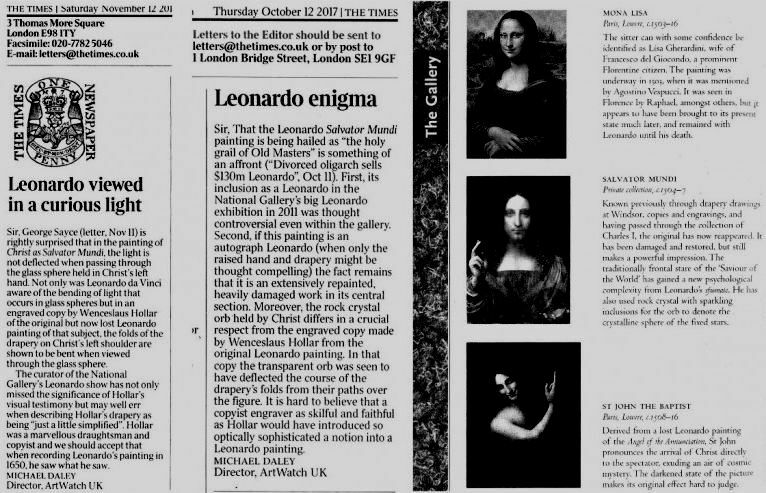 ArtWatch warnings on the Salvator Mundi’s Leonardo attribution: 1) On 11 November 2011 we pointed out (letter, the Times, Fig. 5 above) that the Salvator Mundi painting then on exhibition as a Leonardo at the National Gallery, and that is now the Louvre Abu Dhabi picture, lacked a sophisticated optical effect copied in 1650 by Wenceslaus Hollar from a painting then thought to be a Leonardo. 2) On 19 October 2017, nearly a month ahead of the 15 November sale of the Salvator Mundi at Christie’s, New York, we objected (in the Guardian) that the painting was inconsistent with Leonardo’s depictions of figures; that it lacked the sophisticated optical effects copied by Hollar; and, that there was insufficient evidence to support a Leonardo attribution. 3) On 14 November 2017, the day before the Salvator Mundi sale at Christie’s, New York, we warned that the provenances compiled by the National Gallery in 2011 and Christie’s in 2017 were unsupported, inflated and overly-reliant on then (and still) unpublished researches of one of the work’s first owners – see “Problems with the New York Leonardo Salvator Mundi Part I: Provenance and Presentation”. The day after Christie’s 15 November 2017 sale of the $450million Salvator Mundi, Thomas Campbell, former director of the Metropolitan Museum of Art, observed that the “eye-popping” price was no surprise in a market where “speculation, marketing and branding have displaced connoisseurship as the metrics of value”. 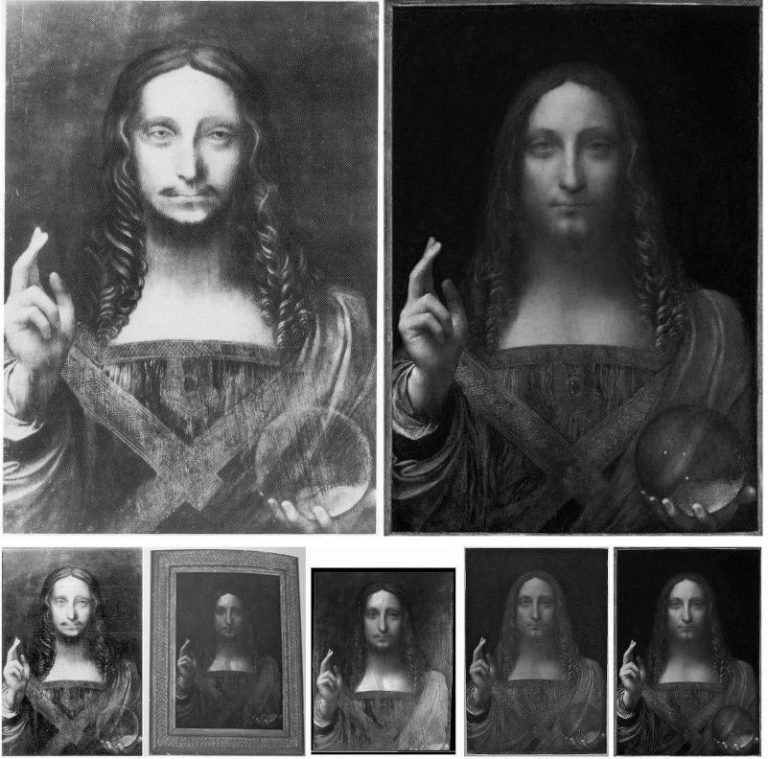 George Goldner, former chairman of drawings and prints at the Metropolitan Museum, has said the allure of the Salvator Mundi “has nothing to do with art and everything to do with money,” and that “If you were to spend $450m on a rare car or diamond and put it on display, a lot of people would come to see it. If the Salvator Mundi had sold for $20m, nobody would go. Any painting that sells for $450m will attract crowds for a while. Then, all of a sudden, people won’t care anymore”. In hindsight, the sale of the $50 million Duccio in 2004 served Christie’s as a model for that of the Salvator Mundi. The task in both cases was to market as an absolutely secure blue chip autograph old master, a work that had arrived very late in the historical day, without provenance, and from within a large group of related but artistically diverse pictures. Both works were successfully presented by Christie’s, on substantial expert authority, when, on a full art critical and documentary interrogation, neither can safely be so regarded. The case for the Metropolitan Duccio has been put principally by Keith Christiansen in: the Fall 2005 Metropolitan Museum of Art Bulletin (“Recent acquisitions”, p. 15 – “among the most important single acquisitions of the last two decades”); an October 2007 Apollo article, “The Metropolitan’s Duccio” – which was described as “the first full account”; the Summer 2008 Metropolitan Museum of Art Bulletin – “Duccio and the Origins of Western Painting”; also in 2008, a special Met re-printed publication, Duccio and the Origins of Western Paintings. As with the Salvator Mundi, Christie’s marketed the painting as a “Last Chance to Buy a Duccio”. 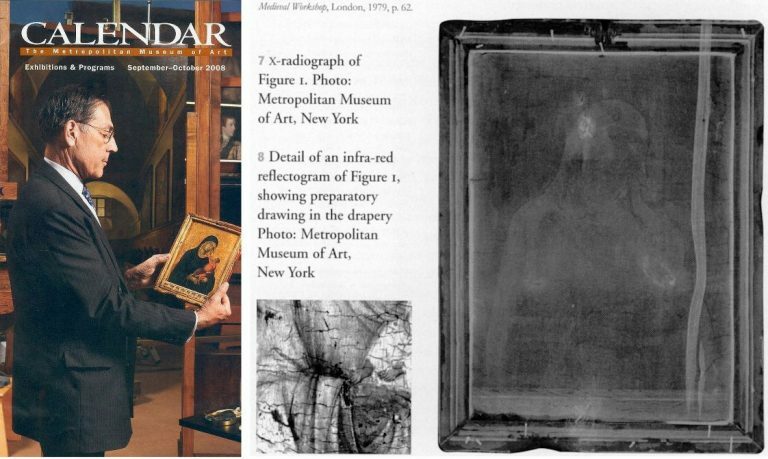 Christiansen is listed by Christie’s as one of the Salvator Mundi’s supporters, as also is the Met’s chief picture restorer, Michael Gallagher, and as was Christiansen’s predecessor as paintings’ chairman, the late Everett Fahy. When purchased, the Met Duccio had never been technically analysed. This long out-of-sight work was only subjected to technical analysis by the Met after acquisition and after challenges to its authenticity had been made by Beck and other scholars. As with the Louvre Abu Dhabi Salvator Mundi, the subsequent technical examination reports were not published or made available to independent scholars. The celebration of “every aspect a departure” within an oeuvre is an inherently problematic and art-critically dangerous intoxication. Above, Fig. 8: Left, the Director of the Metropolitan Museum of Art, Philippe de Montebello contemplating the museum’s Duccio Madonna and Child (after its acquisition); centre, a fragment of an infra-red image of the painting, as published in Apollo in 2007; right, an x-ray of the framed Metropolitan Duccio panel, also as published in Apollo and showing the modern wire nails that no one had noticed or acknowledged. In Calvin Tomkins’ 11 July 2005 New Yorker article “The Missing Madonna”, it is said that the Met’s then head of European paintings, the late Everett Fahy, visited the Stoclets’ house in Brussels in 2002 to negotiate with of one the relatives for the Duccio’s loan (later rescinded) to the 2003 exhibition in Siena. Fahy may possibly have been the first scholar to see the painting in over fifty years. Tomkins reports Fahy saying that the picture “still hung then where it had always had, in Adolphe Stoclet’s private studio”. Christiansen later reported (Apollo 2007) that “Stoclet did not hang his gold ground pictures in this modern [Josef Hoffmann-designed house] setting but kept them in a large cupboard, taking them out, one by one, on Sunday afternoons or on the occasion of a visit of a guest such as Berenson.” Kenneth Clark had been the source of the cupboard storage claim. Fahy noted, “Everything the Stoclets collected was something you could put in your hand, small and precious”. Small, but not always precious. As Frances Vieta established (and Beck acknowledged in his 2006 connoisseurship book), Stoclet had owned two little Duccios, one of which proved to be a modern forgery in 1989. It, too, had been attributed to Duccio by Berenson’s protégé, Frederick Mason Perkins, who, along with Berenson’s wife, Mary Logan, had also upgraded the Met Duccio Madonna and Child, and two hugely expensive sculptures bought by Helen Frick that were also subsequently exposed as modern forgeries. Berenson himself had been taken in by half a dozen or so modern forgeries. The Cleveland Museum had been taken, too, but recovered when it identified modern wire nails and paints in a “Sano di Pietro” and declared it a fake. Before the Met picture had been first upgraded to Duccio by its owner, some had thought it a Sano di Pietro. The Cleveland Museum downgraded another Sano di Pietro to a school work when it – like the Met picture – was found to contain azurite not ultramarine. “With attributions”, Fahy held, “it’s not the number of people who agree with you, it’s the quality of their judgments.” The Louvre Abu Dhabi Salvator Mundi had, reportedly, been unsuccessfully offered to Christie’s in 2005. “Although the ‘Madonna and Child’ was well-known in art-historical circles as the only one of Duccio’s dozen or so surviving paintings to remain in private hands, its whereabouts had been uncertain since the death, in 1949, of its last registered owner, the Belgian collector Adolphe Stoclet. In fact the picture never left the Stoclet House in Brussels. Stoclet and his wife… had willed the house to their son, Jacques, whose widow held onto it until her death in 2001. Soon after that, her heirs, (four daughters) who are very high on anonymity, agreed to lend it to an important exhibition in Siena, Duccio and his school…a few weeks before the opening in 2003, the painting was withdrawn. This coincided with rumours of an impending sale, which turned out to be true. Tomkins reported that, in addition to the transparency, Nicholas Hall had given Christiansen the “lavish presentation booklet that Christie’s had prepared for prospective buyers”. On whose imprimatur or on what scholarly authority had that booklet been prepared? How many people got to see it? When Christie’s auctioned the Salvator Mundi, the publicly-disseminated provenance was frankly acknowledged to have derived from the National Gallery’s 2011 catalogue entry; the restorer’s 2012 report; and, through their declared joint indebtedness, to the (still today) unpublished researches of one of the original 2005-2012 consortium of dealer/owners. Christiansen continued (to Danziger): “My director fortunately is a person who loves old master paintings, who grew up with old master paintings and worked as a curator in this department and does not need to be told much. He was completely riveted by it. He asked me the price while he kept looking at it, and then he said, ‘I don’t see how we can get it…’ But that, I imagine, was also when the wheels began to turn in his head, because when I left, I thought there was a real possibility.” In the heady post-acquisition days of November 2004 Christiansen recalled to Carol Vogel in the New York Times that when the director was first shown the photograph “it took him about 30 seconds to say ‘We really have to have this’”. At the same time, Tomkins had made clear why de Montebello might have gagged on the price. The Getty Museum (which has been bitten by fakes) had already turned it down: “reportedly, because of the price. This struck Christiansen as ironic because the price was so clearly predicated on the fifty-five million dollars that the Getty had agreed to pay, two years earlier, for Raphael’s small, perfectly preserved Madonna of the Pinks.” That little Raphael in the mint of condition had, like the even littler Met Duccio, lost its original back when, for some reason it was polished by its artist/restorer/dealer/smuggler owners. When the cradle was removed from the back of the by-then Met Duccio, it was found to have been scraped down to the bare wood, on which was written an ascription to…a member of Duccio’s school. Like the Salvator Mundi, the little Raphael was one of many versions of the subject – there are over fifty-five Madonna of the Pinks. James Beck remarked in his 2006 connoisseurship book: “I find it appropriate to claim, given the situation as has already been sketched, there is no chance whatever that the Northumberland painting is an original Raphael.” But for sure, within a couple of weeks of seeing the photograph, de Montebello, Christiansen and the Met’s chief restorer, Dorothy Mahon, flew to London to see the Madonna and Child armed with a magnifier and a UVF lamp to spot retouches. The next morning, after a couple of hours of inspection at Christie’s in London with Christiansen and Mahon, de Montebello made a quick and high offer (without Board authorisation). It was immediately accepted by Christie’s but under the terms of this “private treaty sale” the picture could not be removed from Christie’s to undergo examinations at the Met and be presented to the Board’s Acquisitions Committee for appraisal and possible approval, as was customary. This was because, as Christiansen put it, “the picture wasn’t leaving Christie’s until the whole deal was finished”. Why so – and why accepted by the Met when such a huge sum was at stake? Had this condition been stipulated by owners who seemingly had developed cold feet about the picture being seen for the first time in over half a century in the context of a show on Duccio and his followers? Above, Figs. 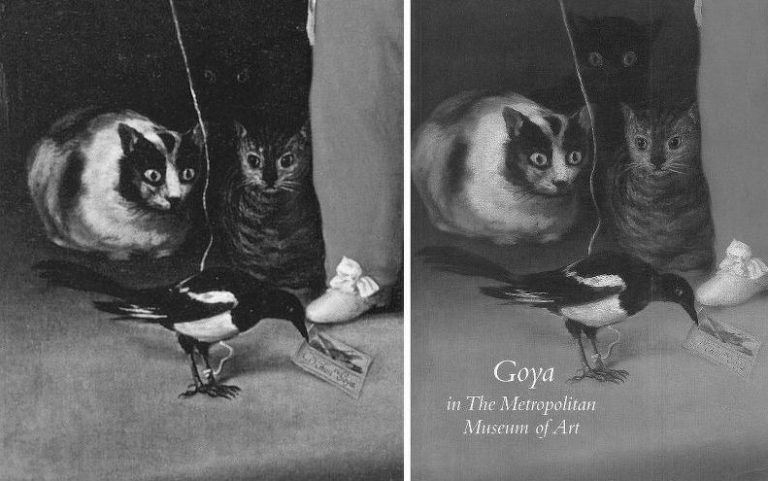 9 and 10: Details of the Met’s Goya portrait of the young Manuel Osorio Manrique de Zuñiga who died before he was eight years old. As seen before cleaning (left) and after cleaning (right). In Part II we consider why the Met team might have been advised to view the National Gallery Duccio triptych (and its dossiers) before visiting Christie’s and buying on the spot. “When the Duccio was on offer, I had, as Director, to decide whether the picture was worth the huge sum I would have to raise to acquire it. To arrive at this decision, I had to wear several hats all at once: one of these was that of an informed art lover, the French ‘amateur’, and in that role focus on the seductive and lyrical lines, the harmony of the colours, the felicitous choreography of the hands and feet, the wonder of the human contact coincident with a certain respectful detachment in the depiction of figures, that are, after all divine. I also had to don my art historian’s hat and note that this Duccio was one of the very first pictures that mark the transition from medieval to Renaissance image making. It represented a key moment, a break from hieratic Byzantine models to a more gentle humanity. “To be more specific, and it is more than just a recondite detail, look at how the parapet at the bottom connects the fictive, sacred world of the painting with temporal one of the viewer. 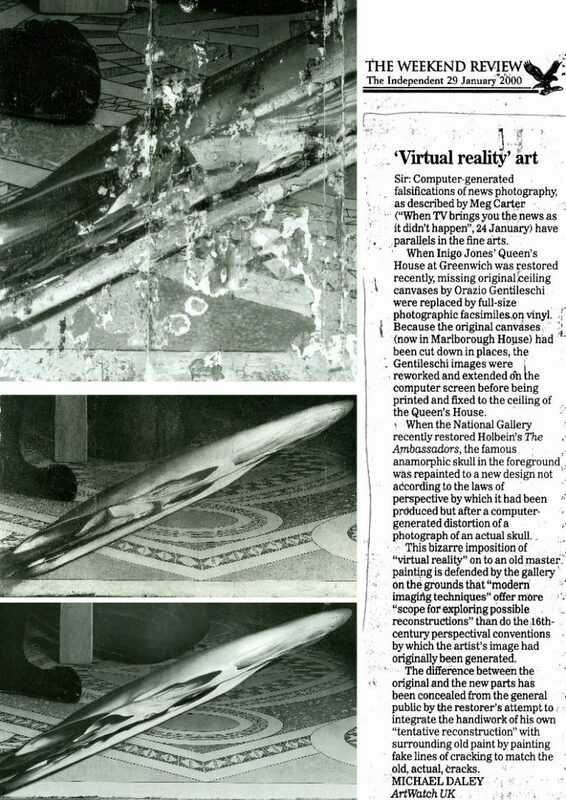 This important observation – among others – was made by the curator Keith Christiansen as we were examining the picture in London. This led him to conclude that Duccio must have seen the Giotto frescoes in Assisi depicting the life of St. Fancis, where the illusionistic framework, including the parapet, relates the narrative scenes to the architecture of the church. But Martin, you want to know the truth? All those considerations were largely irrelevant when the time came to decide whether to spend in the region of $45 million on the work. For this, I needed my museum director’s hat. The quantitative assessment had to be based on different criteria. First and foremost were the old-fashioned notions of quality, craft and skill. Did the work sing? Did it stop me in my tracks and did it then hold my attention? Was I reluctant to turn away from it too quickly? “However, in my mind, the question of relative importance and quality was always pushing itself forward. That the work was beautiful and admirably well painted was not enough. It needed also to be very important, exceptional in every way, and extremely rare. If there had been three or four others similar to this one it would have meant that this picture should command a lower price. “Then there was the question of what the price of this panel should be in comparison with one of the missing predella panels from Duccio’s Maestà in Siena were it to come up for sale. This is because the Madonna was and is a self-contained, independent and devotional image; it doesn’t belong to a larger work, the wholeness of it is part of its beauty and impact. The entire story is there in that one painting. That, too, added to its value. “Then, as curators, we also needed to be concerned with the physicality of the work. After all, this object, which can be held in the hand, has weight and a certain thickness, and is vulnerable to the vagaries of time. Part of what drove me to buy the Duccio was the fact that for close to an hour I did hold it in my hands, that I did turn it around, looking at the back, sensing its weight, measuring its thickness. It had a corporeal reality that was almost, to use a paradox, mystical. “No longer bound by image alone, as one would be when looking at a photograph – or even from a distance – I then focussed on the deep burn marks at the bottom of the frame, obviously made by votive candles, confirming that this was indeed a devotional picture. Just a few additional details resulted from close examination, not the least of which was that the picture was in impeccable condition, a rare thing when it comes to Trecento gold ground pictures, as most works have suffered greatly over time, mostly I’m afraid at the hands of restorers. If you are a student of art, just think of the Jarves collection at Yale, where many of the pictures, early renaissance works, are now a near total ruin. We were also able to confirm that this was indeed not an incomplete work, a wing of a Diptych for example, there is a hole at the top indicating that the picture was hung from a hook. “Then, of course, came the issues of the provenance or ownership history, an important preoccupation of art historians, for what it may reveal about the work. While it obviously began life as a devotional picture, made for an unknown patron, it eventually ended up in the hands of two major European collectors: Count Grigory Stroganoff at the end of the 19th century, and later the Belgian financier Adolphe Stoclet, in his Brussels house, which is a masterpiece of the Wiener Werkstätte. Also, the Duccio had been lent to the great Sienese exhibition of 1904 where it was highly praised; indeed one art historian Mary Logan (Bernard Berenson’s wife), deemed it the single finest work in the exhibition. In addition, and not a minor factor in gauging the price, was the knowledge that there would most probably never be another Duccio for sale, as this was the only work of his known to exist outside of a museum. I also knew – which is why I made a quick and high offer – that the Louvre, the other major museum that did not have a Duccio, was after it as well and was going to make a real effort to buy it. “So some competitive nerve was struck, and thus the need for pre-emptive action. While it may not have been conscious, I think that there is no question that a part of me wanted my institution to own that Duccio – over and above its importance to the proper representation of the development of Sienese art in the Trecento – simply to have it as yet another major work that would confirm the stature of the Met. “At this point, the sum of all the above, which occurred in a rush of sensory and intellectual responses, led to an important psychological factor, which should not be underestimated in such cases: it is that of the curator/acquisitor experiencing what is a quasi-libidinal charge (you might even call it lust, albeit of a high order); the irrepressible need to win; to have taken the object of desire. You can’t get away from that. We are all human beings. Institutions are not just made of stone, glass and steel, they are run by people. It is absurd to try to maintain and project total objectivity.